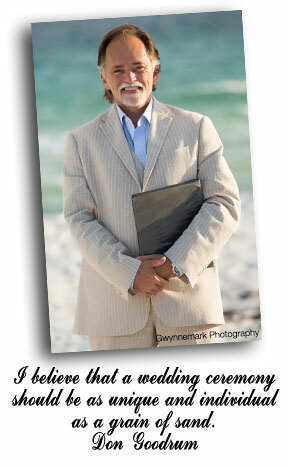 Providing Ceremonies in Destin, Panama City Beach, Pensacola & More! Your wedding is a unique beginning; a blending of two lives. It forever stands as a marker to the commitment of each to the other and the forsaking all others. It should reflect your hopes, your dreams, your personality. 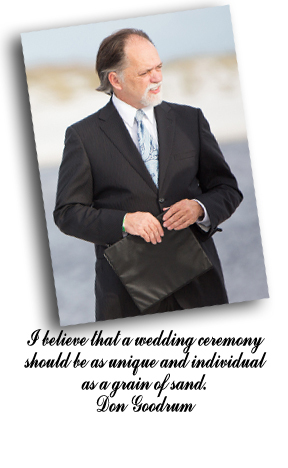 It should be the wedding you’ve always wanted–a ceremony completely under your control. If this is your goal, I can help you achieve it. 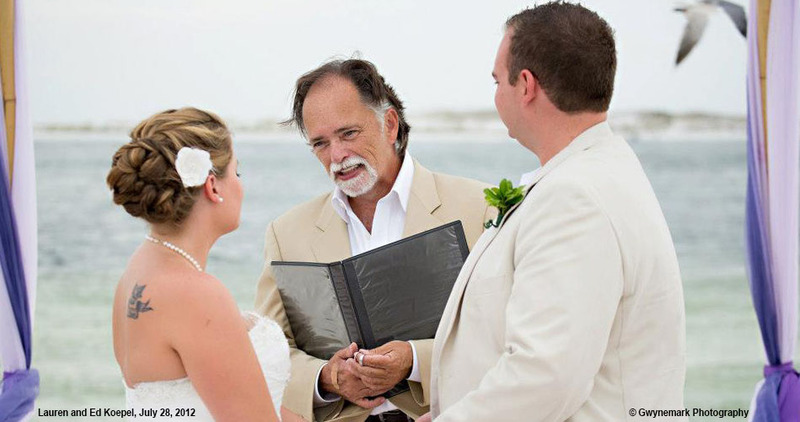 As your officiant (the minister who performs the ceremony), I can help you craft the words; the spoken promise of love that two people make to one another on their wedding day. I also perform the task of actually taking your words before God and your family and friends and making them public. 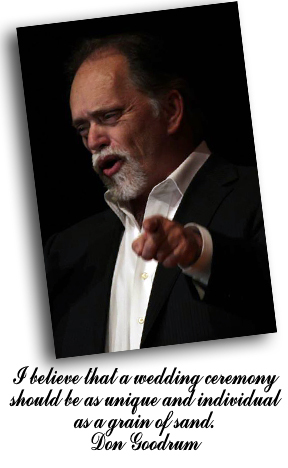 I’m not a wedding planner. I don't provide the flowers or the candles (see Resources), I provide the voice of your commitment to each other, to God and to those in attendance. Raised in a Southern Baptist home, I trained at the Midwestern Baptist Theological Seminary in Kansas City, MO. 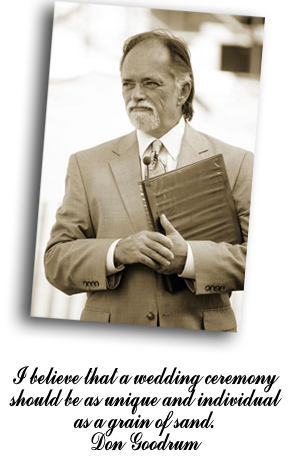 I was licensed as a Southern Baptist minister in 1984 and ordained through the Universal Life Church in 2002. This is not just a job; not something I do simply to make a living. I consider these weddings to be my calling, and consider myself to be God's representative in these proceedings. Therefore, while you can design your ceremony to include many personal touches, the only thing I insist on is an acknowledgement of Him on some level within the ceremony. I don't mean that we need a huge wedding mass with complete choir and fifteen readings from scripture, I prefer my weddings to be much, much smaller and more intimate than that, but if I am to marry you in God's name, then I believe you should acknowledge Him somewhere in the ceremony, if only through prayer. 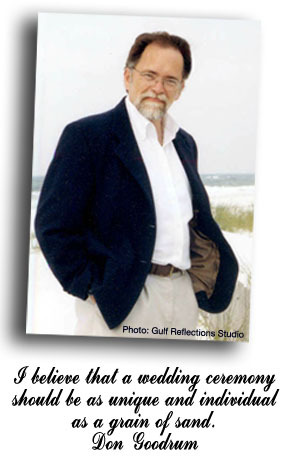 I am a registered instructor for the marriage preparation course in Okaloosa, Santa Rosa, and Walton Counties. If you choose to utilize this 4-hour course and you are both Florida residents you are eligible for a discount on the initial marriage license fee. (See Resources). I take this pre-marital counseling seriously, so don't expect a simple rubber stamp approval, but if you would like to sit down and discuss the complexities of married life with an interested third party, I am available. The purpose of this email form is informational and does not represent a contract for my services.